Countries must ensure that older persons are able to fully participate in society and have their voices heard, Secretary-General Ban Ki-moon stressed today, noting they play a key part in the shaping of the post-2015 development agenda. By 2050, 80 per cent of the world’s older people will live in developing countries and the population over 60 years old will be larger than the population under 15, according to the UN Population Fund (UNFPA). With the 2015 deadline for achieving the eight anti-poverty targets known as the Millennium Development Goals (MDGs) fast approaching, discussions to shape a vision for development beyond that date are intensifying. “In this effort, we must address shifting demographics, especially the needs and concerns of the world’s increasing number of older persons,” Mr. Ban said. This year’s theme for the Day, ‘The future we want: what older persons are saying,’ has been chosen to draw attention to the efforts of older persons, civil society groups, UN organizations and Member States to place the issue of ageing on the international development agenda. 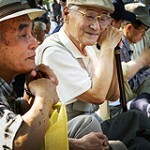 Mr. Ban underlined that older persons can help shape the post-2015 development agenda not just by contributing their wisdom, but also by voicing their current needs and concerns. “[Older persons] are calling for a world where all have food, shelter, clean water and sanitation, and access to basic health services and education. I have included these messages in my vision for a transformative post-2015 development agenda, which is set out in my report, ‘A Life of Dignity for All’,” Mr. Ban said.